The end of the story was gruesome–a spray of bullets and a splattering of blood on a wall in central Romania. On Christmas Day 1989, after a hastily arranged trial before a kangaroo court, the deposed Romanian dictator Nicolae Ceausescu and his wife, Elena, were executed by a firing squad. The assembled soldiers, eager to eliminate the despised dictator, were ordered not to aim higher than his chest. The faces of the condemned had to be recognizable after the fact. The country had to see that the communist era was over. The fall of communism was as decisive a turning point in modern history as the French or Russian revolutions. In 1989 the Soviet empire in Eastern Europe collapsed; the division of Europe symbolized by the Berlin Wall crumbled; the cold war began to recede into historical memory; and more pluralistic, sometimes democratic, states emerged where one-party dictatorships had dominated for four decades. (It was also the bicentennial of the fall of the Bastille.) Statist, ostensibly planned economies yielded to freewheeling capitalist markets; and hopes were raised, momentarily as it turned out, for a “new world order” without debilitating ideological conflicts. Interpretations of the causes of the collapse of communism and the Soviet empire are becoming as numerous as books on the subject, especially in this, its twentieth-anniversary year. At one extreme are fatalistic accounts that trace the demise of a utopian system structurally flawed at its conception. At the other are highly voluntarist and contingent explanations that focus on the key players–the Polish pope, John Paul II; the determined but inconsistent reformer Mikhail Gorbachev; and an array of actors on both sides of the barricades, from Lech Walesa to Nicolae Ceausescu–who shaped a welter of dynamic and volatile events without ever being able to control them. But the events themselves were so consequential for our own times that few are content to stop with narration, analysis and explanation. Moral and political lessons are to be learned. Judgments about socialism, capitalism, democracy and the social engineering intrinsic to modernity are to be handed down. The events of 1989 are most often depicted as the failure of socialism. It’s a powerful interpretation that has served to discredit alternatives to the capitalist system, which is said to have triumphed, and to bestow upon capitalism an aura of legitimacy based not only on a reading of recent history but also on assumptions about the natural order, not least human nature. Capitalism, it is proposed, is the normal state of human traffic in what people make and value and need; socialism is the deviation. Capitalism responds to the nature of “man”–acquisitiveness, competition, egoism and the insatiable need for more. Socialism stands in the way of initiative, creativity and competition. Going by its nom de guerre, communism, it proposes radical equality in a world of unequals. Therefore, it can be maintained only by the coercive power of an entrenched elite and a repressive state. In the Eastern bloc, once that force was removed and party leaders lost confidence in their right to rule, communism naturally fell, and people’s instinctual drives for material accumulation were liberated. Markets won out everywhere, even when democracy did not. History, however, is always more complicated and messy than the moral and ideological tales it may be called to serve. The history of Eastern Europe in the second half of the twentieth century can be told as the story of two series of revolutions: the communist-led revolutions of the post-World War II years that ousted the former ruling elites and transformed largely rural societies into urban industrial ones; and the anticommunist revolutions of 1989, mostly peaceful and in one case even “velvet,” that overturned entrenched party regimes already weakened by political sclerosis. In Eastern Europe, one form of “actually existing socialism” was established at a particular historical moment–the beginning of the cold war struggle between an enormously wealthy, nuclear-armed United States and a significantly weaker Soviet Union. Forty years later, communism fell when political crises, economic stagnation (but not economic collapse) and a will to change the way the system worked coalesced at another historical moment. To the lasting dismay of democratic socialists in Europe and elsewhere, it was a moment of Thatcherite/Reaganite neoliberalism, vigorous anticommunism and muscular military and covert operations against the left and radical movements in all parts of the globe. As for socialism, what originated in the early nineteenth century as a noble political philosophy devoted to promoting the common good was reduced to an epithet hurled at anyone skeptical of the workings of laissez-faire or the idea that capitalism is intrinsic to the natural order. Socialism has a long history, but it has not been able to escape the crushing burden of its recent Leninist incarnation. The end of the story was also confusing. How did two empires fall–one in Eastern Europe, the other the Soviet Union itself–with little effort by the imperial power to prevent their disintegration? The upheaval and downfall occurred so quickly, so unexpectedly, that journalists could barely keep up with it and scholars were left disoriented. Twenty years on, in Revolution 1989, journalist Victor Sebestyen offers an analysis that foregrounds human actors and avoids larger conclusions about the structural factors that contributed to communism’s disintegration. Constantine Pleshakov, a historian at Mount Holyoke College, does not shy away from evoking the positive achievements of communist power in order to explain its durability, but most of the story he tells in There Is No Freedom Without Bread! is ultimately about the cascade of events, from Poland to Afghanistan, that overwhelmed the creaky “socialist” system and its creaky operators. 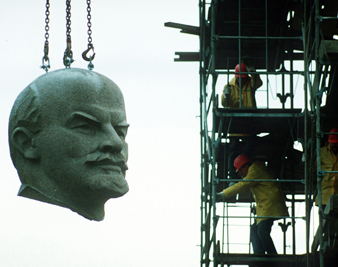 In Uncivil Society, Stephen Kotkin and Jan Gross, historians at Princeton University, offer a deeply structuralist analysis of communism’s collapse. Their narrative combines a certainty about the unreformability of state socialism, at least in Eastern Europe, with a preachy confidence in the inevitable triumph of capitalism. For all their differences in tone, perspective and scope, these three books are masterful and reliable accounts of a time when the world turned right side up (no pun intended). Like the two world wars that preceded it, the cold war began in Eastern Europe, a fragmented frontier between developed industrial capitalism and its agrarian poor relation, still largely peasant, traditionally religious and fiercely nationalist. This was not a particularly hospitable place to launch a socialist revolution à la Marx–especially when that revolution was associated with Russia, the Great Power most resented by Poles, Germans, Hungarians and Romanians. Stalin’s USSR was slowly recovering from its costly victory over fascism. It was suspicious of the intentions of its former allies and determined to retain the territorial spoils of the recently concluded war, stretching from its western borders to central Germany. The “East European Revolutions” of the 1940s and ’50s were largely, though not entirely, imposed by the Kremlin, and the system eventually built was modeled after the most draconian variant of what has been called socialism, namely the Stalinist command economy and police state. Realists in the East and West understood that given military conditions and Soviet notions of security, the question of whether capitalism or communism would dominate Eastern Europe was moot. The true question was not if but how Stalin would control the “liberated” countries. Would they become allied but autonomous states, like Finland, or fully Stalinized and Soviet-manipulated police regimes? At first the Soviets promoted coalition governments and gradual social transitions. The pre-war elites had been discredited by their collaboration with the Nazis, and the politics of most of Eastern Europe gravitated leftward. In Hungary, Poland and Romania, hundreds of thousands of acres of private property were turned over to peasants. In Poland, industry owned by Germans was nationalized. Russians were popular in Czechoslovakia, Yugoslavia and Bulgaria, and the same social reforms easily gained support there. But four of the countries taken by the Soviet army–Germany, Hungary, Romania and Bulgaria–had been part of the Axis, and they were drained of resources as reparations for the Soviet Union’s staggering war losses. As in the Soviet Union, communists in Eastern Europe were brutal modernizers. Kremlin leaders believed that the security of the USSR went hand in hand with the transformation of the countries on its western border from agrarian to industrial, peasant to proletarian. By the late 1940s any deviance from the strict Soviet form of “revolution from above” led to expulsion from the communist bloc (as in the case of Tito’s Yugoslavia); the purging of dissenters; or even the execution of veteran party leaders, including László Rajk in Hungary, Traicho Kostov in Bulgaria and Rudolf Slánský in Czechoslovakia. In There Is No Freedom Without Bread!, Pleshakov introduces the metaphor of civil war to revise conventional accounts of 1989 in Eastern Europe. He argues that if socialism was as fundamentally flawed, and its fall as preordained, as the fatalists say, it would not have lasted as long as it did. The regimes not only survived for forty years but were relatively stable and even enjoyed a degree of popular support, in large part because of what Pleshakov calls “social contracts between the rulers and the ruled”: “No Communist state could have done without secret police–but people accepted the state not just because of terror and intimidation, but also because of free health care, free housing, and free education.” Dissident Poles may have shouted in 1980, “There is no bread without freedom!” but Pleshakov claims that the reverse was also true. The communists not only expropriated land from the aristocracy and the church but secularized education, provided jobs in new industries and made life and livelihood more secure and predictable. Furthermore, they extended Poland territorially by annexing German lands to compensate for the loss of the eastern part of pre-war Poland that Stalin incorporated into the Soviet Union. They abetted the deportation of hundreds of thousands of Germans from Poland and Czechoslovakia and guaranteed the new borders of the state, as well as the independent existence of the German Democratic Republic (GDR). Hungarians, Czechs, Slovaks and Poles were not happy with the loss of territory ceded to the USSR and Romania; but the presence of the Soviet Army, along with the internationalist rhetoric of Marxism-Leninism, at least prevented the recurrence of the worst excesses of ethnic nationalism that had long plagued the region. Economies grew in the years after Stalin’s death in 1953; energy was cheap, subsidized by Soviet exports; and in general Eastern Europeans lived better in the periphery of empire than most Russians did in its metropole. For those existing, as we say, “under communism,” Pleshakov argues, making a living came first and was for many years almost enough to make the socialist experiment seem gratifying. Even after the “Soviet Union and its version of communism had lost luster,” he says, egalitarian Marxism, a more human form of communism without terror or Russians, continued to have broad appeal. But the Kremlin’s decision to crush the anti-Stalinist uprisings of 1956 in Hungary and 1968 in Czechoslovakia left those hopeful for another kind of socialism feeling bewildered, if not betrayed. What they got was “vegetarian” communism or (for the omnivores) “goulash communism”–more goods, some travel abroad, less repression, but only the most muted voice in politics. By the early ’70s the regimes looked stable, relatively prosperous and likely to endure. But the command economy by itself couldn’t uphold the social contract: East Germany, Poland, Hungary and Romania borrowed heavily from the West to maintain an aging industrial base and a standard of living comfortable enough to keep populations relatively quiescent. The debt owed to foreign banks swelled, and a cycle of falling productivity and growing discontent accelerated. In retrospect, the second round of Eastern European revolutions appears to be the culmination of four crucial events. The first two were the mass strikes of 1970 and 1976 in Poland, which forced the government to make concessions to popular protest and culminated in the formation of Solidarity, the officially recognized independent trade union, in 1980. Eventually Poland’s communists could no longer placate the burgeoning workers’ movement, and party chief Gen. Wojciech Jaruzelski reacted by declaring a “state of war” in December 1981, arresting thousands, Walesa included, and driving Solidarity underground. The third event was the election, in 1978, of Karol Józef Wojtyla as Pope John Paul II. The Kremlin was appalled that a cleric from the Soviet bloc had been elevated to a position of global influence. The pope did not have any armored divisions at his command, but his moral authority at home and abroad translated into what Marxists understood to be a “material force.” Soon hundreds of thousands of civilians would be on the street or on strike, inspired by John Paul II’s refusal to compromise with Marxism. Money from US intelligence agencies, funneled secretly through Western labor organizations and the church, helped to fuel the movement. The fourth event was the most unpredictable: the selection of Mikhail Gorbachev as general secretary of the Communist Party of the Soviet Union. Gorbachev’s radical reforms turned, step by step, into a revolution that crippled the party and dissolved state authority. His greatest gift to the USSR’s satellite states was to restore their sovereignty and pledge not to interfere in their affairs. To the dismay of hardliners like Erich Honecker in East Germany, the Soviets refused to back up former client states facing popular protests. With sharply drawn anecdotes, Victor Sebestyen relates in Revolution 1989 what happened when a reluctant Gorbachev traveled to East Berlin in early October 1989 to observe the fortieth anniversary of the GDR. In his public remarks the Soviet leader pointedly turned to Honecker and warned, “Life punishes those who fall behind.” That evening, as the two party leaders watched what was billed as a celebratory torchlight parade, blue-shirted, red-scarved Communist Youth marched by the dignitaries’ podium pleading, “Gorby, help us; Gorby, help us.” The rot had penetrated so deeply that even the sons and daughters of the elite were calling for radical reform. For two weeks the party and state apparatus floundered in the face of demonstrators, but Gorbachev ordered the 380,000 Soviet troops stationed in East Germany to remain in their barracks. Meanwhile, in Poland, Hungary and Czechoslovakia, communists and opposition figures held roundtable discussions to negotiate free elections in those countries and eventually the transfer of power. Less dramatic than crowds in the street but equally devastating was the accelerating payments crisis faced by the communist states that had been borrowing heavily from foreign banks for decades. After they conspired to remove Honecker as party boss in mid-October, German Politburo members were shocked to learn that the country was essentially bankrupt. But when Egon Krenz, the new party boss and Honecker clone, went hat in hand to Moscow, Gorbachev brushed him off: “We are in no position to offer assistance, not in the USSR’s present condition.” On November 9, 1989, an East German party spokesman answering a question from NBC’s Tom Brokaw about the new travel policy for East Germans mistakenly stated that it was now possible for people to cross the border freely. (The spokesman had meant to say that the old visa restrictions were being lifted and that people could apply for passes allowing them to cross.) Within hours, thousands gathered at the wall. They climbed over it, danced on top of it and began tearing it apart. For many in Russia, the sense of national security they had gained from the Soviet army’s westward advances in 1945 was buried in the rubble. For the self-proclaimed “socialists” of the communist regimes, everything from the reforms of Gorbachev to the tearing down of the wall was evidence not of revolution but a counterrevolution bent on the abolition of socialism. In November 1989, the Czech politician Alexander Dubcek, the hero of 1968 who had championed “socialism with a human face,” spoke at a press conference in Prague and proposed a reformed socialism. The man of the hour, playwright and dissident Václav Havel, interjected, “‘Socialism’ is a word that has lost its meaning in our country.” For Havel, socialism was identified with the regime that he and his supporters were seeking to overthrow. Dubcek had failed–as Gorbachev would two years later–to comprehend how far the popular mood had shifted away from his shopworn ideals. At the very moment that Havel and Dubcek shared the microphones, it was announced that the entire communist leadership of Czechoslovakia had resigned, and all forms of socialism, from communist statism to Dubcek’s Social Democracy, seemed to melt into the air. As the drama of 1989 moved toward a denouement in Eastern Europe, in the USSR reform was rapidly mutating into revolution. Gorbachev’s promotion of elected bodies–the Congress of People’s Deputies and, later, elected soviets–shifted power from the Communist Party to broad parliamentary institutions. Politics moved from the cloistered offices of high party officials into the spotlight of unscripted televised debates. The Soviet Union lasted two more years before disintegrating into fifteen separate states, but by 1989 the communist system of a single governing party and a command economy all operating under strict censorship had vanished. What had once been an ironclad freighter labeled “totalitarianism” was being replaced daily by a jerry-built ship at sea, hardly seaworthy and already foundering in the turbulent waters of economic crisis. Gorbachev called his project of perestroika (rebuilding) a “revolution,” even though he did not anticipate the loss of power by the party he headed. He probably intended to eliminate the communist system but wanted neither the end of socialism, which he defined as a politics dependent on and requiring democracy, nor of the USSR. And he certainly did not anticipate the precipitous rejection of party rule in Eastern Europe. (As Stephen F. Cohen has pointed out in an essay on the reformability of the Soviet system, the pessimists doubted the system could be reformed, because it would cease to be the Soviet system–a tautological statement. That, of course, was always the revolutionary potential of a radical reform from above.) But after Gorbachev had successfully reformed the system out of existence and set adrift the Soviet empire in Eastern Europe, the example of decolonization became a powerful incentive, first to dissident nationalists in Armenia, Georgia, Estonia, Latvia and Lithuania, and later to communists in the non-Russian republics. Even the old communist Boris Yeltsin discovered the political advantages of nationalism: after repeatedly defending the integrity of the Soviet Union, in 1991 he conspired with the leaders of Belarus and Ukraine to bring down the Soviet state, and Gorbachev with it. In the last few years of Soviet power, Gorbachev was not only unwilling to use force to retain control of the Eastern European states but extremely reluctant to use coercion against recalcitrant and rebellious Soviet citizens to compel them to obey existing laws and to prevent separatism. Violent suppression of demonstrations and protests and even pogroms occurred in Georgia, the Baltic republics and Azerbaijan, but the use of the police or army was intermittent, hesitant and usually followed by concessions or apologies. Gorbachev, it turned out, did not have the “iron teeth” that Andrei Gromyko, in nominating him to the highest post in the land, had promised he possessed. Revolutions are almost always accompanied by violence and often followed by civil wars. Lenin unhesitatingly called for civil war when he was struggling for power and used terror as a tool for state-building. Unlike another state preserver, Abraham Lincoln, Gorbachev was reluctant to use the military and political instruments at hand to keep his union intact. Kotkin and Gross argue against the cherished notion that an organized revolution from below occurred in Eastern Europe. They view Poland as an exception, but this caveat does not lead them to grant Poland the central role cast for it by Pleshakov and Sebestyen, who see the Polish workers’ rebellion in 1980 as creating an existential dilemma for the Soviets. With the Soviet army engaged in Afghanistan, sending troops into Poland was unthinkable for Moscow. Since the Polish party could no longer rule in the old way, party chief General Jaruzelski was forced to declare a “state of war.” Poland was certainly unique, and according to Kotkin and Gross, more common was the process of “nonorganized mobilization,” most evident on those December days in Bucharest when a lone voice was sufficient to turn a crowd against Ceausescu. Mobilization against the state in Eastern Europe, they go on to argue, did not happen in or because of civil society, that imagined community of anticommunist dissidents of the 1970s and ’80s: “Needless to say, in 1989 ‘civil society’ could not have shattered Soviet-style socialism for the simple reason that civil society in Eastern Europe did not then actually exist.” Dissidents a civil society do not make. Instead, “it was the establishment–the ‘uncivil society’–that brought down its own system.” Totalitarianism, in Kotkin and Gross’s view, made civil society impossible. That extra-state arena of “people taking responsibility for themselves” with “recourse to state institutions to defend associationism, civil liberties, and private property” was a mirage. Poland’s Solidarity mesmerized Eastern Europe, but in no other Soviet bloc country were citizens able to repeat its successes. “Uncivil society” constituted a world of structural incompetence. The Soviet system itself, its practices of secrecy and coercion, its culture of suspicion, promoted the loyal rather than the capable, the submissive rather than the innovative, the risk-averse rather than the creative. Communist regimes in Eastern Europe fell because the elites were unable to change their ways; Gorbachev refused to support them and demanded that they reform. When the “uncivil society” of an illiberal state was no longer able to manipulate or even gauge the mood of its own people, it found itself bereft of the most basic instruments of government. Kotkin and Gross provide an intriguing revision of the usual narrative of mobilized popular resistance to “actually existing socialism.” Highlighting the failures at the top is key to understanding the collapse of communism, but that emphasis must be supplemented by attention to what went on below. Both organized popular resistance in Poland and more spontaneous mass mobilization in most of the other socialist states, as Pleshakov and Sebestyen extensively and persuasively demonstrate, contributed to the crises that made the communist regimes unsustainable. Eastern European communists promised something besides social justice and equality; to their own detriment they also promised greater prosperity and productivity than was possible under capitalism. Khrushchev repeatedly spoke of “reaching and surpassing America!” This was yet another failure in the face of capitalism. The economies of Soviet bloc countries, themselves eager to incessantly increase output, were ultimately outperformed by the West. Nowhere was this contrast more evident than in Berlin, where the radiance of the western sector outshone the more subdued lights to the east. Not only were the Soviet-style economies unable to compete successfully but, by engaging with the bankers of the West, they became dependent on loans and saddled with onerous debt. The “social contract” trapped the socialist states; they could neither modify the subsidies that underwrote low consumer prices nor use the capitalist weapon of unemployment to restructure their economies. China’s “market Leninism” showed one way out–a turn toward capitalism without democratization–but Eastern European communists hesitated to take that path. Even Hungary, the most market-oriented, would not permit labor or capital markets.